A delightful display of pretty flowers in cool shades of lilac and soft cream. The petite wooden basket is the perfect way to show off this lovely selection of fresh blooms which includes scented freesias and a beautiful white rose. 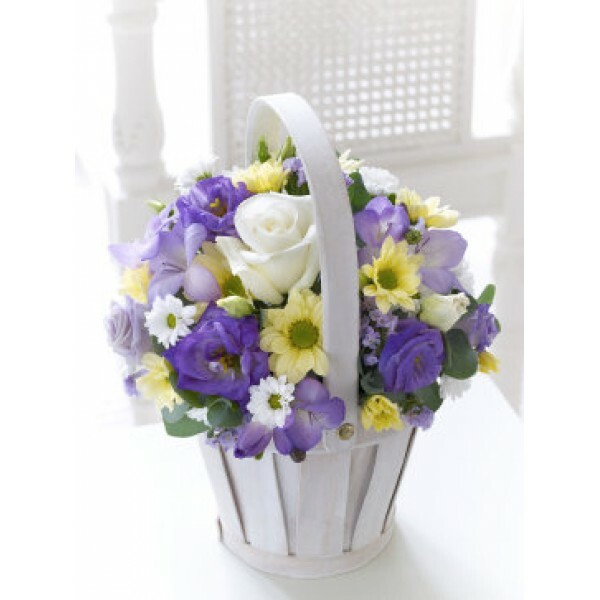 Featuring 3 blue freesias, 1 blue lisianthus, 1 white long-stemmed rose, 1 cream spray carnation and 1 white spray chrysanthemum with lilac statice and eucalyptus, presented in a whitewashed wooden basket.